This project required us to design, supply and install an integrated audio visual system for use in services and performances. The size of the church meant we had to carefully design a sound system, which would provide both full range reproduction as well as even dispersion. Kendal Parish Church is unusual in that it has five aisles, this made the design of the system particularly challenging. We decided to use Electrovoice loudspeakers and amplification, along with advanced audio processing to ensure the highest intelligibility for speech. The church also wanted us to design a video distribution system, which would allow them to plug a source such as a laptop, into any of five different locations within the church. The video is displayed through two 60” LED displays, which are mounted on automated raising stands from Unicol. These stands enable the displays to be lowered and wheeled away for secure storage and so as not to affect the aesthetics of the church. As well as flexible input locations the church also required the displays to be positioned in a number of different locations, dependent on the service they were being used for. To achieve this we used a CAT6 HDMI distribution and switching system from Kramer Electronics, which is very simple to use yet enables full HD signals to be transmitted over great distances around the church. 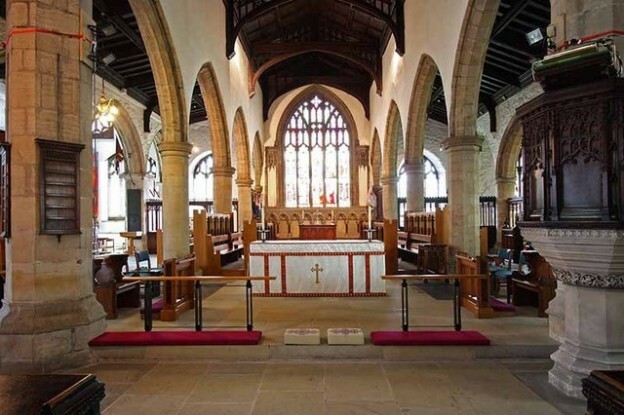 All of the equipment we supplied had to be neatly and discretely installed due to the listed status of the church. We had all sixteen speakers custom painted to blend in with the natural stone finish as much as possible. The equipment racks were housed in custom made oak cabinets which again helps the system to “disappear” in this most sensitive of environments.